Sir Robert Bryson Hall II is a Gaithersburg, Maryland-born American rapper and singer who is better known by his stage name Logic. Born on 22 January 1990, Logic is mostly noted for being popular on the internet where he has become prominent along with his friends as a member of RattPack. An aspiring rapper, Logic has released many mixtapes in his active years in the field of music that started in 2009. 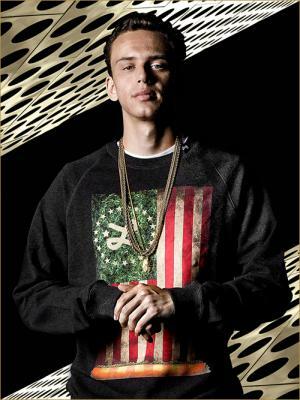 A popular rapper with a vast number of internet fan followers, how rich is Logic? As of 2015, this popular rapper has accumulated a net worth of $3 million, with all of his wealth being amassed from his musical career. With his passion for songwriting and rapping, Logic has made a small fortune in no time. He is currently signed with Def Jam Recordings and Visionary Music Group from where he has been recording and releasing albums and mixtapes. All these projects contribute extensively to Logic’s net worth. Born to a virtually destitute family, in which illegal substance abuse was no new thing, Logic was raised by his parents who were crack users. After struggling in school as Logic was not a bright student, he failed every class except English, and was thrown out of his school. As a teenager, Logic started to put his focus on writing songs and rapping., and his interest in the English language made him a good songwriter. He was later mentored by Solomon Taylor who helped him excel in writing lyrics and rapping as a teenager. At that time of his life, Logic was known by his then stage name “Psychological”. Later, as he began to find his prominence in mainstream music, he changed his stage name to “Logic” which has stuck throughout this whole time of his musical success. Logic began to find commercial success by releasing mixtapes and becoming popular on the internet. He released a string of mixtapes after debuting with “Young, Broke and Infamous”; his other famous mixtapes are “Young Sinatra”, “Young Sinatra: Undeniable”, and “Young Sinatra: Welcome to Forever”. Other than sales of these albums, “Logic” has also made money out of his popularity on “YouTube”, on which his songs have been viewed well over a million times. On top of that, Logic has also released his debut studio album entitled “Under Pressure”, from the labels “Visionary Music Group’ and “Def Jam”. As this album is proving to be a successful release, Logic has been adding considerably into his net worth. Talking about his personal life, Logic aged twenty-five was just recovering from a log-term relationship as he stepped into his musical career. He has not made anything public about his current affairs so we believe that he is single and available at present. Even as a successful multi-millionaire, Logic apparently doesn’t lead a lavish lifestyle, and reportedly is clean as he does not smoke or drink alcohol as of now. This impressive rapper who found success only due to his hard work and passion is continuing his career with other projects in hand, and is in the process of releasing his second studio album.